I have nothing but love for this series! I really enjoyed the first book in the series, Deep Blue, but Rogue Wave by Jennifer Donnelly took this series to another level for me. I had a few concerns while reading the first book but reading Rogue Wave made me forget all about them. 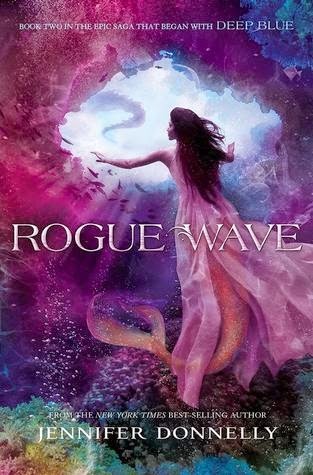 I loved that while this book features many different mermaids who are instrumental in the story's plot line, Rogue Wave is mainly concerned with two particular mermaids. Serafina, the main character in Deep Blue, and also her best friend, Neela. Both Sera and Neela (and, of course, the other mermaids, Ava, Ling, Becca and Astrid) are on the hunt for more answers concerning this evil thing that is infecting their waters and the talismans that are needed in order to defeat the bad guy. Both Sera and Neela go on really exciting and dangerous adventures in this book that include shipwrecked ghosts and deadly dragons and honestly, my heart was in my throat and I was on the edge of my seat throughout most of this book! And while I think Sera is an amazing main character and I really feel for her, for me, this book was all about Neela's journey. I loved witnessing her go from a slightly ditzy, sweet-obsessed mermaid who was overly priviledged and maybe slightly spoilt into a mer who is strong and capable and pretty fierce. It was difficult at times to see how much her family and friends resented this change in her but I'm glad to see that she doesn't give up. And at the same time, this book uncovers some very emotional and surprising truths about Sera's love life and about the betrayals she faced in Deep Blue. It was the thing I was most looking forward to finding out more about this situation and I definitely came to the conclusion that it was definitely worth the wait! I know that mermaids and underwater stories won't be everyone's thing, but after reading these two books in this series I know for certain that it is definitely MY thing. Will be waiting impatiently for more! You know what, I don't think I have ever read a book where mermaids are the main characters but your review certainly interested me.